The statement No. (1/2018) which was stated on January 10, 2018 by the Myanmar National Human Rights commission on the Global New Light of Myanmar in regards the ARSA terrorists attack the vehicle carrying members of the security forces with explosives device, and small arms from the hillock of North West of Kyein Chaung village in Maungtaw township, Rakhine state around 10:00 am on 5 January 2018 and a driver and two members of security forces were wounded -- was nothing more than the bogus message of similar to entire media outlet of Myanmar. In Arakan (Rakhine) state of Myanmar, there are several groups of illegal armed organizations, some fighting against the central regime of Myanmar for their self-legitimate right and some are nothing to demand the due legitimate rights to the regime. Those (Thet armed group, Dianet & Mro armed-men) are plausibly assisted to survive through their ways of looting, robbing, destroying and killing Rohingya people by well aware of regional and central government. Among them, some (two of Rakhine Buddhist organizations that have coordinated the regular contact with local Rakhine populace to fight against the central regime and Rohingyas Muslims) are well known by central government of Myanmar and international community for their constant claims to Rakhine state authority and the central government of Myanmar as the stakeholders. Time and again, regional and central government have been openly advocating and fulfilling the necessary things on the tiny groups of several minorities, dwelling along the Mayu Mountains and that of the ridges as people of recognized indigenous inhabitants and militants. The regional and central regime’s philosophy has been to be able to charge visible multiple faults that (are blamable on Rohingyas and beautiful justification by the regime) the both governments want in time to blame & punish on innocent Rohingyas the preplanned heinous oppressions by the government forces. The Government has been contemplating beautifully and drastically the state multiple sullied and horrible games hand in hand with the mountain dwellers to circulate the filthy playoffs to be shown to the faces of international community that neither Rohingyas ordinary people nor ARSA, the so called Rohingyas armed militant have ever committed crimes against the government. To censure on Rohingyas, and at the same time, to hide behind to the inhumane atrocities that have been committed against Rohingyas Muslims by the regime with a coordinated efforts of mountain dwellers: “Mro, Thet, Dianet and Rakhine Buddhist armed men” in north Rakhine state. And, to lay out the dishonest reasons not to be repatriated the Rohingyas people as much as earlier as per the demand of international community and in line principle of the global norms, which demanded by the fled Rohingyas to Bangladesh. Now reasoning as if ARSA’s attack in north Arakan, Myanmar regime, which asserting just because of the ARSA’s attack in north Rakhine, that, in fact, there is no visible ARSA on ground nor possibly ARSA might not have committed any attack as accused, Myanmar government has been manipulating several kinds of unreasonable reasons to the world. The government of Myanmar insists the recent ARSA’s attack in the region is as the terrorist attack and that ARSA does not desire the fled refugees to be repatriated soon and wants various instabilities in the region. In that ground, government saying, it is impossible to construct the buildings, roads, schools, religious constructions, professional structures, and livelihoods in time due to be repatriated Rohingyas people that both governments of Myanmar and Bangladesh have reached an agreement in November 2017. What a hallucination of Myanmar government to blame on ARSA for her dishonesty to implement the world demands due to Rohingyas people rights restorations, successful repatriation, livelihood establishments, building harmonious societies and processing of Rohingyas people citizenship. Blaming on recent ARSA’s attack which created by the military is a huge new tragedy to revert all the agreements Myanmar has reached bilateral and international consensus between and among the nations in regards Rohingyas. Not only that, there are a lot of operations one after another in the region, north Rakhine state against Rohingyas people who still reside in their villages. Couple of days ago, a military combine operation with indigenous mountain dwellers has thrown some explosives to the fishpond of the village, Chin-Tha-maa (Khan-Sa-Ma) nearby Phaung-Daw-Byin village in north of Buthidaung Township. Later, military authorities have summoned the village head and let him gather his male villagers to find out the ARSA attackers and their ammunitions. The military authorities, asserting the prior information that there were ARSA attackers in the village and many arms and explosives being hidden underneath of the pool. Then the authorities have had let the villagers to fetch out the water from fishpond until the end to find out the explosives which the villagers have no knowledge about the episode. In accord the villagers, the entire ARSA attackers or those of the ammunition have been a pretext, a plain game, and attachments to flee Rohingyas from the village that may fear of being randomly arrested, severely tortured and the exorbitant compensation in return military authorities’ clemency. Many young men were arrested and ever since they have been severely and inhumanely tortured to confess to be, ARSA attackers and ammunition found at the fishpond belong to them. What a trap! 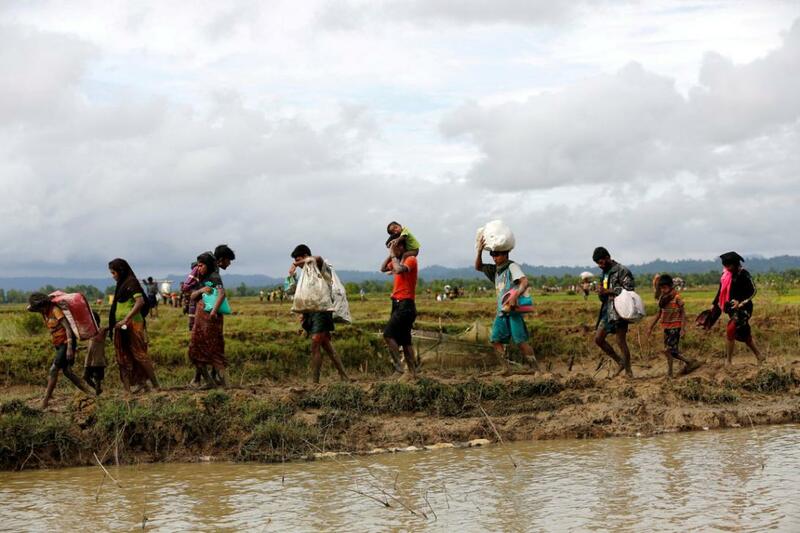 Likewise, the remaining Rohingyas in the regions have been under extremely threats and multiple intimidations under the form of one way of another reason or pretext by the military strategies adopted by S.G Min Aung Hlaing and military branches to torture the remaining Rohingyas people physically and mentally in the regions to get out of the region. Every Rohingyas remaining in the regions are in a state of suspense or impatience due to the worry of military’s inhumane maneuver on Rohingyas innocent day in day night who are barely unprotected by law but Rohingyas as preys to be killed by military-predators and its coordinators. It seems that military strategies to expel all Rohingyas in the region who remained in their location yet, and military will commit whatever they want to annihilate all Rohingyas in the region to cleanse altogether. Ever since its establishment as Human Rights Commission of Myanmar, it has never stood from the sufferers who are helpless, hopeless, and vulnerable all along the country. They simply, inconsiderably, dishonestly, and irrationally stand by the side of oppressor, and tyrants as a protector not to be blamed by the world community. The question now is what is a job of Myanmar National Human Rights Commission to carry out in this country under the identity of ‘Human Rights Commission’? Myanmar Human Right Commission is a whole sale TICKET of brutal regime supporter, it does not regard the Rohingyas as human being, and the Rohingyas’ agony is regarded as a glee by the hearts of the Human Rights Commission members of Myanmar. May GOD perish all those who are the members of Myanmar National Human Rights Commission?